I have gotten a lot of great response from a post about how to fix a problem with muting and the Comcast DVR. So I thought that I would share another great tip about the cool box, how to get the video off of it and onto your Mac. I currently have two of these DVR boxes, interestingly enough both are a little different. The good news is this technique works on both. The second box that I got, has a eSATA port on it, which I find very interesting. I have not tried to do anything with it yet, but I will let you know when I do. So you want to get the digital video off of the DVR and onto your Mac. Well you can do it, kind of. Unfortunately there are issues with this technique that are beyond our control. The cable company can add copy protection to the signal, which makes it impossible to watch. As of now, I have not found a way to get around this. The good new is that the local channels (channels that would be broadcast over the air) must remain unencrypted. Now that we got that out of the way, here is how you do it. 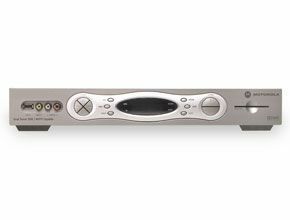 Start with the Motorola Dual-Tuner DVR High-Definition Set-Top DCT6412 or similar unit. As I mentioned, I got mine from Comcast, but I think there are other cable companies like Cox that use the same box. Then you will need a Mac and a standard firewire cable (six pin to six pin). I recommend that you run the latest version of OS X, as I have not tried this with anything other than Tiger. Next you will need to download the FireWire SDK 22 for Mac OS X from Apple. 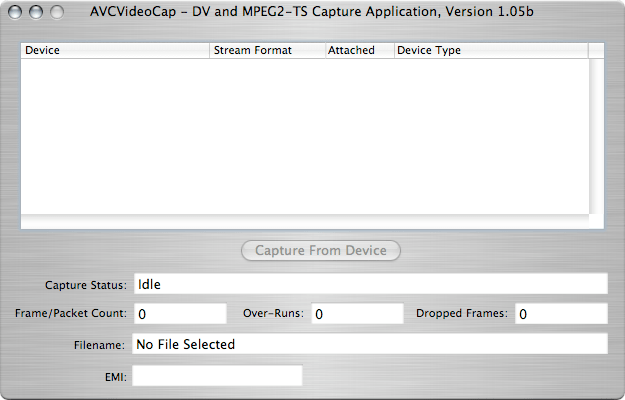 This developers tool kit provides a cool app called AVCVideoCap. NOTE: FireWire SDK 22 for Mac OS X is the latest version at the time I am writing this. There may be a newer version by the time you read this. Anyway download and install the SDK. Now you have everything that you need to get started. As a safety measure you may want to shutdown you computer and DVR before you connect them with the firewire cable. 1. Connect the the DVR and the Mac with the firewire cable. 3. If all is good with the world you should see your DVR listed in the device window, select it. In the image above there is no device listed, so if your screen looks like that, there is a problem. 4. Turn your DVR to the channel that you want to record (you can also do this through the computer in the next step). 5. Note the EMI status. This is what will tell you if the video is copy protected or not. Copy Freely means that you can record it no problem. Copy Once, means that you can copy it, but you will not be able to view it. 6. Select the capture from device button, you get a dialog box with some more options. They are pretty much self explanatory, so fill them out and start recording. The file that you will record is a MPEG-2 transport stream. So you will have a file that will end in .m2t. Since these are not really common file type they can be a bit complicated to play. The best app to use to view these files is the VLC media Player. This app should play these files without any issues. For more advanced use, and conversion I recommend two more programs. The first is MPEG streamclip, a great quicktime based MPEG app. And since you will be working with MPEG-2 you will need to buy the MPEG-2 playback component for QuickTime. You may want to try things out before you shell out 20 bucks, but it does make life easier. And that is it. While it might sound kind of complicated it is rather easy and fun. It is really cool to be able to view these high definitions videos on the computer. Apple has clearly laid the groundwork for someone to create a Mac DVR app, it is just to bad that copyright is such and issue with this type of stuff. But as and alternative, there is a cool product called eyetv hybrid that looks really cool. I have not tried this, but I would love to get my hands on one. When and if I do, I will let you know what I think. Hello … I have new MacBook and have a comcast hd dvr I want to get my recordings from dvr onto my macbook to burn onto dvd. I followed the steps in your post but for some reason my mac does not seem to be detecting the dvr is there a certain setting on the dvr that I need to do I tried in both i movie and by downloading software mentioned in your post but when opening the avcvideo cap it does not detect anything either. I would greatly appreciate any advice. I have the devices connected via a firewire cord and tried things of dvr like record to vhs and accepted that and nothing was coming up on my computer. Just tested with Firewire SDK 25 and a Comcast Motorola DCT3412 I running Leopard 10.5.1. Worked flawlessly with no additional setup. Make sure your firewire cable is connected properly and this should work like a charm. Good luck! What about taking that content off tne Comcast DVR and onto a PC netowrk not MAC. I have firewire on my pc’s. I have great content that I don’t have time to watch but if I could stream it to another room where I indoor bike I could. Not looking to pirate stuff just watch what is stored on one DVR on another or a PC etc…. Puzzles why this is a big deal. i was wondering if this will work with verizon???? First off, thank you for the information. I have been wondering how to do this for some time. Thanks for the instructions. I would like to add that the instruction/owners manual for the Comcast HD-DVR gives you instructions on how to copy stuff from the DVR to a VCR (naturally HD programming wouldn’t work this way). Although there is protection on some cable programming, it’s nice to know, that for personal use, Comcast doesn’t seem to be too concerned about this. On MB Pro, Leopard 10.5.6, got this up and running in about 15 minutes no problem. Very nice tutorial, thanks. Now I just need to figure out how to get the _existing_ recordings off the DVR. BTW, my DVR service is through Cox, not Comcast. @CHAD, dont you just start playing the recorded content and then record on the Mac? I thought it recorded whatever was being viewed, maybe thats not how it works. I have a PowerBook G4 runnint 10.4.1 with FIreWire SDK 26 and am trying to pull from a Comcast Motorola DHC3416. I think I’m having issues with AVCVideoCap. I can see the device and it originally shows as open. After I save the file I don’t get the properties box that I see referenced in all online docs. When I click the capture button I get an error message that says “Cannot open device”. I have a comcast dvr.. i want to record the movies saved on my comcast dvr to a dvd.. is that possible? Hello, is there a way to export video from a mac to comcast dct3400 via firewire? I just captured recorded 720p from a Motorola DCX3425 (labeled DCX3400, but it has a 250GB HD so that might make the 25 at the end). It was recorded the night before and played through the DVR out the FW cable to my MacBook Pro running Leopard and FW SDK26. I started the capture and then unpaused the DVR. No probs. I couldn’t play the file in Quicktime 7 Pro (don’t think I have the MPEG2 plug-in), but it played in VLC. I have read that local channels can be recorded, but not the encrypted higher channels or movie channels. I’m going to try that next. I could transfer a recorded copy of the History Channel and TNT to my Macbook. When you hit the capture button on the Mac, it is best to pause and unpause the recording (starting in a place before you actually want to transfer) so make sure the audio gets through. Note: When I was transferring this time, the picture on the TV was stuttering like heck, but the video on the Mac was perfect. I don’t have any movie channels to test this with, but I’m going to record Star Wars on Spike and see if I can transfer that. just wondering, how big would a 1 hour file be? around 3 gigs i’m estimating? because sometimes i want to be able to record nba games when i’m not at home, but anyway, this method works perfectly! thanks! USE SDK 20 on Mac OS 10.4 – SDK 26 won’t work for me either! I’ve tried to record from the Motorola 6412 using AVCVideoCap, but some channels, even though coded “copy freely” turn our to be full white screens. Are these encrypted anyway? I don’t have problem with some other HD channels. BTW, I get really good results with recording HD, converting using MPEG Streamclip, then importing to Final Cut Pro, then burning blueray disks using Toast 10 Platinum. Beautiful. Hey I have a Motorola DCX3400 and a Mac running Snow Leopard 10.6.2 and I am trying to pull it up in Final Cut Pro. Has any one been able to make that happen? When I open Final Cut it says that it cant find the device. I also have a MacBook Pro running OS X 10.5.8 and am using a Cox motorola DVR. I have tried the front USB port and the rear USB port, but the device is not recognized in AVCvideo.cap. Any suggestions? I’m using a USB 2.0 A to A cable from the DVR to the MAcBook as usb are the only compatable ports I have. I’m getting video from the DVR but no audio? I’m not getting anything from the boxes live channels. I used to do this a few years back with the same cable box and a Mac G5 tower. With that setup I never got HD to record. Ok may have found one issue. ok, i have a comcast dvr with a full hard drive, ive gotten usb canles, ethernet cables titanium toast 10 for $100, every person i talk to has a different method. is there a way to hook the mac to the dvr and select all, copy, and paste??????????????? Figured I would give this a shot. I am using a Motorola DVR DCX 3400, Late 2008 MBP w/ 9pin to 6pin firewire cord. I downloaded the latest firewire sdk… And it just worked. lol Can record live tv or from the dvr function. When recording from the dvr function it does stutter on the tv, but the recorded file plays fine. Just need to work on editing out the commercials. How did you get that download to work? Cant find the app? I followed the instructions and everything worked fine but after a couple of times is no longer transfering the tv shows from the dvr to my mac. I my mac recognizes the DVR and after its done recording it didnt transfer anything. Does anyone have an idea how to fix the problem? I´m transfering the same channels that I didnt at the beginning when it worked out but now it doesn transfer. Confirmed this still works with Firewire SDK 26 on OS X Lion. Thanks for the guide. I just tried this, with limited success. Hardware: DVR is Comcast/Motorola DCT3416; Laptop is MacBook running OSX 10.9.2 (Mavericks); Laptop has no firewire port, only thunderbolt, so I purchased a firewire 800 (9-pin) to thunderbolt adapter, and a fire wire cable with an 800 (9-pin) connector at one end (plugged into the adapter) and a 400 (6-pin) connector at the other end (plugged into back of DVR). I found Firewire SDK 22 (had to sign up as a Developer on Apple Developer and search around to find it), and installed it. Ready to begin, I powered down both mac and dvr, connected up the cable, powered on DVR, powered on mac, opened up SDK 22 app (aka AVCVideoCap), which successfully detected the DVR. I started my playback of my desired content on the DVR and started the capture, for an initial 3-minute test. All went well, and I could watch the video on my laptop in beautiful HD (I used freeware VLC for mac to view the video, which can play .m2t files directly.) I was on cloud 9. Then I decided to try to record the full 1-hour program, so I exactly duplicated my test procedure, but now, about 3 minutes in, the DVR suddenly completely powered down and reset itself. I thought maybe it was a random cosmic-ray kind of things, so I retried it several times, but the same thing kept happening, anywhere from 2 to 5 minutes into the capture (not at the same point in the video or time into the capture). I tried switching to the other firewire port on the DVR, I checked all power and cable connections, I tried unplugging the DVR for a few minutes and plugging it back in, I reversed the order of powering up DVR and mac…in short, I tried everything I could think of. The one thing I did determine experimentally is that it did not only happen when I was capturing, but whenever I had the firewire connected to my powered up laptop. Somehow having the firewire connected to the live mac seemed to cause the DVR to randomly power down and reset.